With over a million observations under its belt and 700,000 iconic pictures to its name, the Hubble is objectively one of the greatest science success stories of all time. Today is the 25th anniversary of the launch of the Hubble Space Telescope (HST), a milestone that is set to be celebrated by space enthusiasts worldwide. Indeed, the very fact that this observatory is still fully operational a quarter century after it was launched is a testament to the craftsmanship and vision of the NASA/ESA collaboration that built it. Despite its tumultuous early years and the enormous advances in spaceflight that have been made since the 1980s, the Hubble still provides the best resolution in the optical and ultraviolet wavelength range in the world. Though it is now approaching its twilight years, the Hubble has proven to be an incredibly resilient spacecraft that still produces new discoveries and stunning pictures every day. From revealing the exotic vistas of deep space to capturing the worlds of our own solar system, Hubble has been humanity’s public portal to the universe for a full generation. To honor this inimitable telescope on its silver anniversary, here is a roundup of our favorite 25 Hubble images, complete with galactic collisions, magnificent nebulas, and close-ups of familiar planets. Enjoy. This picture of the star cluster Westerlund 2 is fresh off the telescopic press, having only been released yesterday as part of the anniversary celebration. Westerlund 2 is about 20,000 light years away, and contains about 3,000 stars. In 2009, Hubble used a newly installed wide field camera to image the aptly named Butterfly Nebula, located 3,800 light-years away in the constellation Scorpius. The Hubble reveals that Saturn is much funkier at ultraviolet wavelengths than at optical ones. Dozens of distant galaxies are visible in every shot of the Hubble’s spectacular series of Ultra Deep Field images. The Hubble’s website describes the idiosyncratic Horsehead Nebula as “an apparition rising from whitecaps of interstellar foam,” which is a truly on-point characterization. This young stellar nursery is located about 1,500 light years awayin the Orion Molecular Cloud Complex (otherwise known as Orion’s belt). This giant Eye of Sauron is a dying star at the center of the Hourglass Nebula. Located 8,000 light years away, the structure’s captivating ringlike halos are the result of strong stellar winds from the star. Speaking of weird cosmic eyeballs, here’s another one the Hubble found. It’s the protoplanetary disk of the young solar system HD 181327, located 169 light years away. Clearly, it’s not uncommon for the Hubble to look out into the universe only to see the universe seemingly staring back. Any telescope can take a wide shot of a nebula, but it takes a pro like the Hubble to deliver a high resolution close-up like this one of Carina Nebula, located 7,500 light years away. This ultraviolet image of Venus was taken all the way back in 1995, when Hubble had only just overcome some of its early mechanical problems. Though it’s more basic than some of the other pictures featured, there’s still something captivating about this close-up of our half-shadowed sister planet. This gravitational dance between two galaxies was captured by the Hubble in December 2010. In its press release about the image, NASA called it “a rose made of galaxies.” So if you’re a romantic and want to one-up George Bailey’s old line about lassoing the Moon, here’s a great new candidate. This heap of billowy gas and dust is alternately called N49 or DEM L 190, and it’s the corpse of a star. Its explosive death would have been visible in the skies thousands of years ago, and now its hauntingly beautiful remains are visible through the Hubble. In this image, a giant red variable star called V838 Monocerotis lights up the surrounding cloud of interstellar gas with energetic bursts of luminosity. This enigmatic star is located 20,000 light years away, and briefly reigned as one of the brightest stars in the Milky Way. The Hubble imaged the fallout of Comet P/Shoemaker-Levy 9’s impact with Jupiter in July of 1994, which marked the first direct observation of a collision between two bodies within the solar system. The impact sites are visible as the brown spots on the right of the picture, like giant planetary bruises. Here’s another gorgeous Hubble shot of Jupiter, this time capturing the chaotic Great Red Spot region. To the left is an adorable mini-storm (relatively speaking) called Red Spot Jr, which first appeared in 2006. 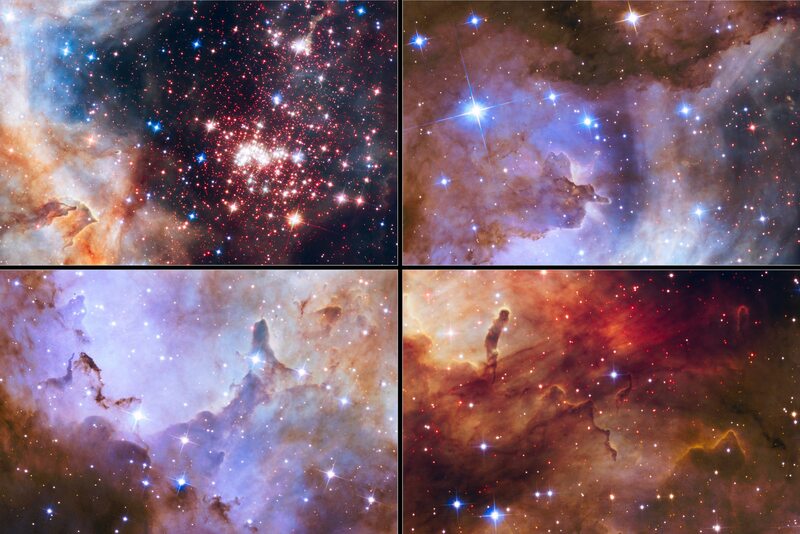 If there is one thing we’ve learned from the Hubble, it’s that nebulas are very photogenic. Pictured above is the Pillars of Creation formation, elephant trunks of gas and dust extending from the Eagle Nebula. This composite photo was taken in 1995, and quickly became one of the Hubble’s most iconic images. In an ode to the original portrait of the Pillars of Creation, the Hubble team took a much higher resolution image of the pillars last year. The above result not only provides a more in-depth view of these spectacular celestial formations, but also demonstrate how much the Hubble’s technology has matured over the last two decades. This star-studded image reveals a cluster of 100,000 ancient stars with the very scifi name of Omega Centauri. Located 16,000 light years away, the cluster is filled with stars in different life stages, some of which date back 10 billion to 12 billion years. These colliding galaxies are 300 million light years distant, and have been nicknamed the Mice due to the tail-like tendrils of ejected material trailing them. Eventually, the pair will work out their gravitational differences and merge into an entirely new galactic system. This fluorescent display of stellar pyrotechnics is the Hubble’s snapshot of Supernova 1987A, one of the brightest supernovae in observational history. The glowing orbs to either side of the ring were ignited by shockwaves from the colossal blast. Uranus is the forgotten child of the solar system, having only been visited once by Voyager 2 all the way back in 1986. But in this image, the Hubble brings out some of the planet’s subtler charms, including its thin set of rings and its collection of moons. The Hubble took this image of Comet Siding Spring in March 2014, a little more than a year after this Oort Cloud comet was first discovered. The comet is clearly sweating off ice and dust as it heads towards its closest approach to the Sun. These dynamic “twisters” of nebulaic material intertwine in the heart of the Lagoon Nebula, some 5,000 light years distant. On the bottom right, the vibrant young star O Herschel 36 shines brightly, a hotspot of ionizing radiation that is gradually clearing the cloud cover around it. Last but not least, here’s the Hubble’s portrait of the Messier 64, which is also known by the badass nickname Black Eye Galaxy because of its unusually dusty core. The image isn’t as well known as Hubble’s pictures of the Jupiter comet impact or the Pillars of Creation, but it has all the hallmarks of a classic HST photo: sharp resolution, spectacular colors, and the latent sense that our journey into space has just begun.